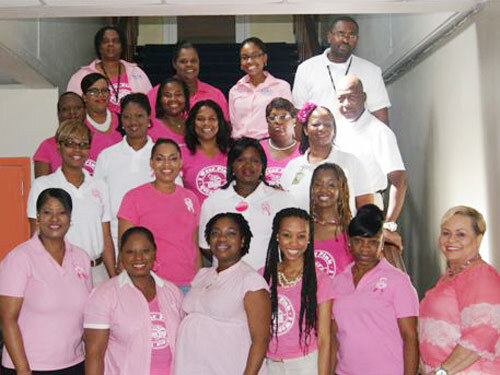 Declaring ‘pink is a vibrant color that symbolizes good health and success,’ staff members of the Nassau Airport Development Company (NAD) recently threw their weight behind two events to support the fight against breast cancer. 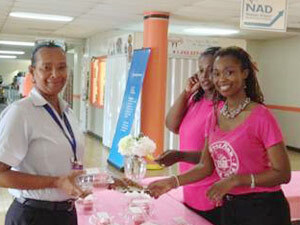 In one event, NAD employees held a bake sale to support Sister Sister Breast Cancer Support Group and The Cancer Society, selling sweets from their creative Pink Bake Shop to many of the several hundred people who make up the Lynden Pindling International Airport community. During the second event, male and female NAD staffers dressed in pink to support the 15th annual Lee National Denim Day, a chance to dress for the cause, raising awareness and funds for breast cancer research and education. “Every year, management and staff show their commitment to the cause of fighting breast cancer, and they display their enthusiasm by bringing creativity and great energy to the related activities,” said NAD President & CEO Vernice Walkine. During the Lee National Denim Day event, a globally recognized event when companies purchase and wear commemorative shirts, bands and other items in support of breast cancer, NAD’s staff took participation a step further by making it a family affair, purchasing shirts and wristbands for family members. NAD has stated that it will continue its support of the Lee Denim Day event for the fifth consecutive year in 2014 as well as other causes throughout the year. Additionally, to aid in the fight against world hunger, NAD is currently participating in the Pure Purpose Network’s island-wide food drive with collected items split between Hands for Hunger and Core of Hope.